Mulk, Anubhav Sinha's new courtroom drama about a Muslim family being branded as traitors, has had its fair share of controversy ahead of the film's release. Trolls on the Internet claimed that Mulk may have been funded by political outfits or underworld don Dawood Ibrahim soon after the trailer released, something which the director responded to with a detailed clarification. Days after Mulk's release, Anubhav Sinha has reacted again but this time addressing the poor rating Mulk currently records on IMDB - it's 3.5 out of 10. "The IMDB rating of Mulk is being attacked," tweeted Mr Sinha, adding: "Mulk has received too much love to worry about that. There are more people who love the film. They will respond to you." While he's not exactly mentioned who his allegation is addressed to, it appears he may be suggesting a case of paid trolls for the disparity in the ratings. IMDB shows Mulk has been rated 10/10 by 16.3% of the voters while 71.6% have rated the movie 1. See Anubhav Sinha's tweet here. Meanwhile, Anubhav Sinha's tweet has started a debate of sorts in the comments thread. While some continue to hail the director for a making a bold movie, others accused him of running a propaganda against a particular religion. "When a filmmaker has a trite script, poor direction, propaganda and lack confidence, all he thrives on his controversies, paid critic writers, LW ecosystem to make money," wrote a user while another added: "Ratings don't matter when you have touched the hearts of citizens." Last month, the director was at the receiving end of vile comments, which trolled him for appearing to criticise Hindus in the movie and this is how he responded: "Mulk is a very nice film. It is not doing what you think it is doing. It is not about your masters. Hindus or Muslims. It is about you and it is about me and mostly it is about us. Please do write back the real nasty ones, but do go watch the film. You will still like it, because I know, a bit of you is still alive inside you." Mulk stars Rishi Kapoor and Taapsee Pannu in key roles. 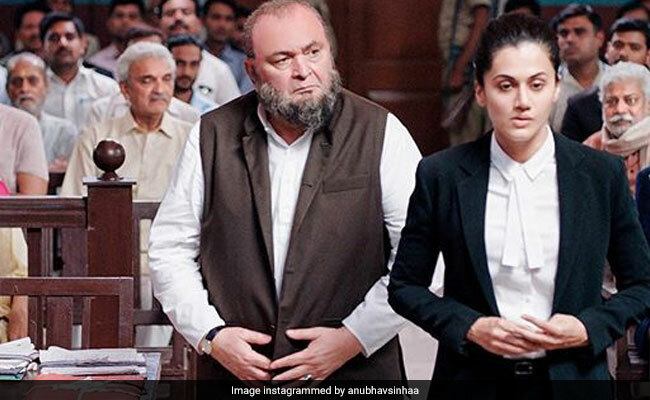 In Mulk, Taapsee Pannu plays a defence lawyer, who tries to prove a Muslim family's innocence, who were shunned as traitors after a family member's involvement in a terrorist activity. Mulk clashed with Fanney Khan and Karwaan at the box office and has made over Rs 8 crores so far.